Loren » Roger Perron Inc. Being a first time remodeling client, we were aware of the many horror stories that seem to be pervasive in the construction industry. 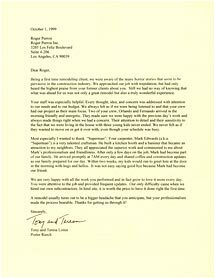 We approached our job with trepidation, but had only heard the highest praise from your former clients about you. Still we had no way of knowing that what was ahead for us was not only a great remodel but also a truly wonderful experience. Your staff was especially helpful. Every thought, idea, and concern was addressed with attention to our needs and to our budget. We always felt as if we were being listened to and that your crew had our project as their main focus. Two of your crew, Orlando and Fernando, arrived in the morning friendly and energetic. They made sure we were happy with the previous day’s work and always made things right when we had a concern. Their attention to detail and their sensitivity to the fact that we were living in the house with three young kids never ended. We never felt as if they wanted to move on or get it over with, even though your schedule was busy. Most especially I wanted to thank “Superman.” Your carpenter, Mark Edwards (a.k.a. “Superman”), is a very talented craftsman. He built a kitchen booth and a banister that became an attraction to my neighbors. They all appreciated the superior work and commented to me about Mark’s professionalism and friendliness. After only a few days on the job, Mark had become part of our family. He arrived promptly at 7 a.m. every day and shared coffee and construction updates as our family prepared for our day. Within two weeks, my kids would run to greet him at the door in the morning with hugs and hellos. It was not easy saying goodbye because Mark had become our friend. We are very happy with all the work you performed and in fact grow to love it more every day. You were attentive to the job and provided frequent updates. Our only difficulty came when we hired our own subcontractors. In hindsight, it is worth the price to have it done right the first time. A remodel usually turns out to be a bigger headache than you anticipate, but your professionalism made the process bearable. Thanks for getting us through it!